What happens when you find out your boss is dead act, like he’s alive! 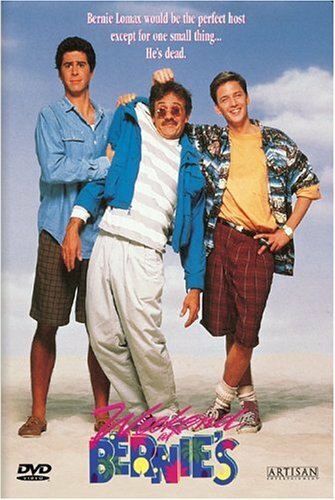 Co-workers Larry (Andrew McCarthy) and Richard (Jonathan Silverman) spending a weekend at the beach house of their boss, Bernie (Terry Kiser), who’s secretly planning to kill the duo because they’ve uncovered an accounting error at the company. But when the boys arrive, Bernie’s already been whacked, and hilarity ensues as Larry and Richard try to keep his death a secret so that they won’t be considered suspects. Bernie’s has an actually good premise which could’ve turned out to be witty, instead just turns out to be a preposterously unfunny dark comedy. The film’s comedy mostly derives from it’s slapstick that was used about 2,000 times. Jokes were either about somebody getting hurt on the head or either just jokes about how Bernie’s actually dead but the people are too dumb to notice. I mean honestly how could you not know the guy was dead, I mean yeah your drunk but it’s not like your blind. The guys not moving and is not even talking, so obviously he must be dead. Dumb people! The film was stupid, but not stupid as in a funny way to laugh at the film funny, more of like it just got so annoying that I couldn’t wait till the Weekend was over. I mean I like dark comedies but there wasn’t even any dark jokes one bit, except that these guys were trying so hard to hide some dead guy. The performances are not that good, and these actors are trying so hard to do their best with this god-awful script, but they just can’t produce anything funny. The one thing I found funny to look for, is when there is a dead body and its just sitting there with a bunch of dialogue, you’ll be able to soon tell when there is a chance when that actor breathes or blinks. I found myself more concentrated on that then the whole film at all. The only good thing about this film that I will say is that I do give this film props for actually going out on a limb and trying to make a good of this film, but ultimately it just suffers way too much. Consensus: Bernie’s is supposed to be a comedy that is not at all funny, and just relies toio much on slapstick and really dumb jokes.